Asteroid 2012 DA14, a 150-foot wide hunk of rock, made its closest approach to Earth at 2:25 p.m. EST on Friday, Feb. 15. It was travelling at a fierce 17,450 mph, or about 5 miles per second. The asteroid came within 17,200 miles of our planet’s surface as it zoomed over Indonesia (where it was 2:25 a.m.). It will continue to fly from south to north and be visible to skygazers in parts of Europe, Africa and Asia through binoculars or a telescope. 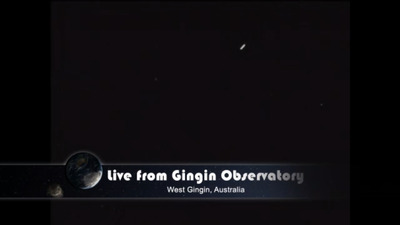 Astronomers at the Gingin Observatory, near the town of Perth, Australia had an incredible view of the moving asteroid, which was streamed live by NASA. A still picture below shows the asteroid as a tiny white fleck against the night sky. The asteroid poses no danger of collision and NASA scientist Don Yeomans confirmed in a live webscast that 2012 DA12 is not connected to the meteor blast that occurred over Russia Friday morning. See the live blog below.